The JP Morgan Asset Management Round the Island Race is set to return this weekend, with more than 1,500 entries already confirmed for one of the UK’s most popular events. The contest, organised by the Island Sailing Club, was first held in 1931 with 25 entries, and has over the past 84 years grown into one of the most prestigious regattas in world sailing. It should be a great day and something I’ve wanted to do for a while now - I want to get around in a good time, though! The race will see competitors complete a full, 50-mile circumnavigation of the Isle of Wight and is expected to attract thousands of spectators and competitors to the Island. The outright race record belongs to Ben Ainslie Racing (BAR) who finished the course in just 2hr 52min 13sec in 2013 aboard the AC45 – the same class boat that will be competing in the Americas Cup World Series event in Portsmouth in July. Among those looking to secure victory will be Rio Olympic hopefuls Giles Scott and London 2012 silver medallist Hannah Mills, aboard the IMOCA 60 Rosalba. Scott, a multiple world champion in the Finn class and also a member of the BAR Americas Cup team, will be participating in his first Round the Island Race. He has expressed excitement at the challenge ahead. ‘I am really excited to get out on the water for this year’s race,’ said Scott. ‘I have never been on an IMOCA 60 before so I’m really excited to helm that. It will be very different from my Finn. ‘I have been to the Isle of Wight a few times, but never been able to venture very far from Cowes, so I am looking forward to going all the way round the Island and seeing it from the water. The race is famous for the wide variety of craft that enter, with the largest yachts competing this year being the 162ft classic schooner, Eleonora, and the current mono record-holder, Ocean Leopard, which stands at 100ft, while Newbridge Navigator Fair Sail, at 19ft, is set to be the smallest. Ocean, the Gunwharf Quays-based boat, is skippered this year by Lee Friend and will be looking to secure class victory again. The day starts at 7am, with 11 separate race groups starting in 10-minute intervals until 8.40pm. 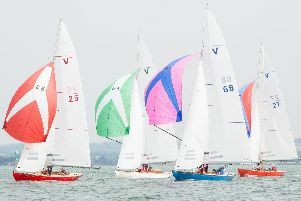 The course will take in a number of landmarks across the Isle of Wight coastline, including Hurst Castle and Ryde Pier. During the first stretch of the race, the boats will pass around the Needles Lighthouse and along the south-west coast of the island to St Catherine’s Point. They go across to Sandown Bay to reach Bembridge Ledge Buoy. And the epic race will conclude with a leg past No Man’s Land fort, through Osbourne Bay and then across the finish line at Cowes.